The way that we shop for groceries is changing. There's a lot of awesome technology that is helping us shop for groceries faster, saving us money, and giving us a better understanding of what we're buying (or pointing us in a direction to buy the right stuff). The days when we struggle to find what we want in the store, purchase enough random impulse buys to double our total bill, and spend waaay too long in line during checkout are coming to an end. 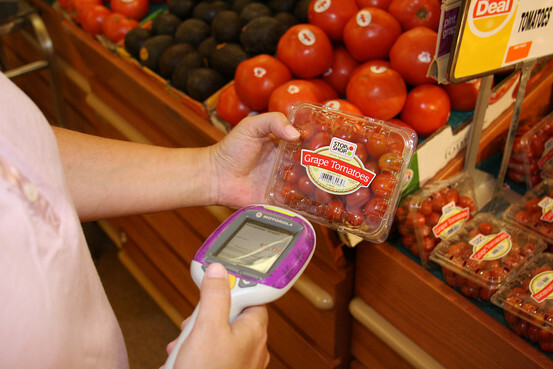 Here is our list of the coolest tech for grocery shopping. These high-tech devices let you scan items as you put them into your own cart, essentially meaning that self-checkout is no more difficult than finding what you want to purchase. In-store scanners can also help you save money, suggesting you items to purchase that are on sale and automatically tallying up coupons. The Dash lets you shop for groceries online by just talking or scanning. You can refill essentials like milk and bread with conveince. To us it seems like Amazon is forgetting something, maybe the recipes? Another brand new development in grocery shopping tech wants to help you save big money in the store. People with the Checkpoints app installed can now get notifications for coupons and extra savings while in the store. Learn more here. Worried about the world's oceans? Checkout the Seafood Watch app from Monterey Bay Aquarium. It tells you what seafood to buy and eat so you can shop sustainably and responsibly with ease. Download it here. There's also this cool new thing called Chicory that lets you create healthy, homemade meals without having to visit the store. Get early access to Chicory here.